I love LOVE. It took me many years, many broken hearts, and many hours spent in therapy to admit this outloud to myself but I just can’t get enough of that thing called love. I believe that love can be big, and fast. It can disrupt your entire being, shake you to your core, leave you raw and breathless. That love is exciting, that type of love is necessary but I don’t believe that is the love that sustains us. I believe the most impactful love is quiet, it is small, and it is made up of tiny acts of love that in their sum of all parts lead to pure bliss and fantastic wonder. No matter how it manifests, I love love in all forms. My husband and I have a running joke about the diamond commercials that play during our evening Jeopardy watching ritual. The premise of these commercials are typically all the same. A beautiful man, and even more beautiful woman, a romantic setting and the presentation of some form of diamond jewelry, because as we have all been trained, diamond jewelry is how you really show a woman you love her right? Each time this commercial comes on, I tease my husband and remind him how excited I will be and how loved I will feel when he finally brings me to the beach during sunset to present me with my diamond jewelry. We always have a good laugh because we both know that a grand gesture, like this is not the way to my heart. But hot coffee in the morning by the bedside? Now that is my love jam. For a long time, I associated true love with grand gestures (think John Cusack and the boombox in Say Anything or the cue card confession in Love Actually...swoon). For many of us, Hollywood has done a phenomenal job convincing us that you will know real love when you see it, because it will be big, it will bold, it will be loud and it will most likely involve some sort of props. As I have embraced mindfulness and the act of slow living into my life, I have come to realize that for me, the wonder in my relationships is not found in the grandiose, but rather from the simplicities in the day to day life. The small acts of love fill me with the abundant love that I crave. When I am able to slow down, bring myself into the present moment, recognize, acknowledge and receive these acts of love I am filled with wonder and bliss. Why do small gesture evoke such wonder? The wonder comes from the softening. When our spouse brings us a hot cup of coffee in the morning, or leaves us a note telling us to “have an amazing day”, or takes the time on a cold winter morning to remove all the snow from our car, we soften inside. We soften inside because these small, quiet gestures say “I see you. I am paying attention to who you are and what makes you happy. You matter to me”. And all we ever want in our life is to be seen, to matter, to feel loved. The small acts of love not only create wonder, but they sustain our relationship, they become the glue that holds us together when the inevitable stressors of life threaten to crack and break us apart. They help us to hang on through it all. Our relationships are like bank accounts. Small acts of love are deposits into our relationship bank account, and every thoughtless act is a withdrawal. As is true for our real bank accounts at the end of the month, ideally we want to have many more deposits than withdrawals. When our balance is high, we feel secure. Small acts of love can be easily minimized or overlooked. We are all working so hard each day. Embracing the many hats, the schedules, the to-dos and the many expectations both real and created in our own minds can be enriching and fulfilling, yet it also runs the risk of robbing us from experiencing wonder, or even worse, leads us to the light in our relationships being extinguished. If we get caught up in the pressure of the future or the worry of the past, and resist gifting ourselves the present moment in which to slow down, we run the risk of missing out on all that delicious and soul-shaking wonder. It is not only important to receive and bring our awareness to the gestures of love from others, it is equally important for us to be able to slow down and ensure that we are taking the time and bringing presence to our own small gifts of love. How do we create wonder for the ones we love? What are our small acts of love? What makes our spouse feel seen, to feel they matter and to feel loved? 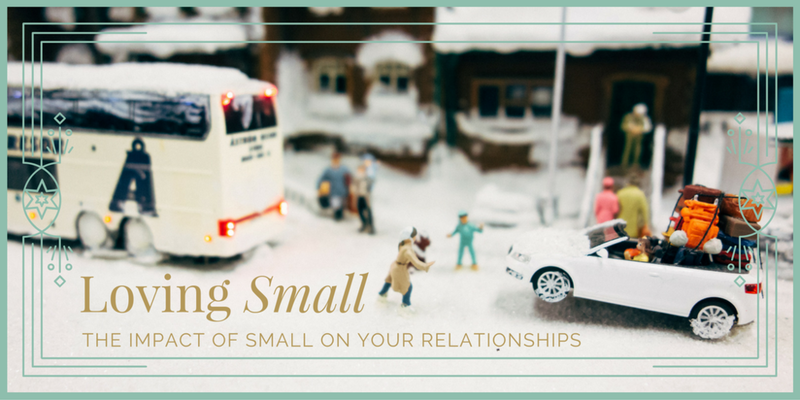 Small acts of love are deposits into our relationship bank account. We put a lot of pressure on ourselves during the holidays to find the perfect gift for our loved ones. New toys, new electronics, warm weather gear and special keepsakes are wonderful ways to show those we care about that we love them. But while we are busy selecting just the right gift for that special someone, can we also slow down enough to be mindful of the small declarations of our love we are able to give in the day to day? The key to bringing out the wonder in our relationships is to embrace slow living. When we are setting an intention to make slow living a part of our life, we are making the conscious decision to slow down, pause, and bring attention to the moment in front of us. In these moments we are able to open ourselves up to wonder.